IRISH RAIL HAS confirmed this evening that the three proposed strike days by staff have been suspended. This comes following a Labour Court recommendation to the company and unions representing the workers. A full service will now operate on 14 November, 23 November and 8 December. The move ensures that a full service will run on Tuesday, the day that Ireland play Denmark in the crucial World Cup playoff. In a joint statement, the unions involved said the decision had been made to suspend the strike until its members were balloted on the proposals. Unions had sought a 3.75% pay increase. 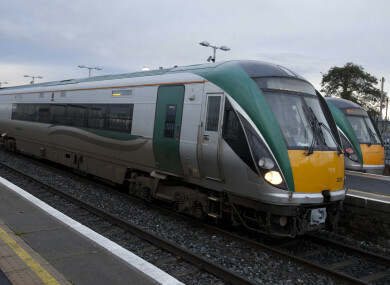 In a statement, Irish Rail said: “The company thanks the Labour Court for arranging a hearing of the issues surrounding the current dispute, and for the urgency with which it considered the submissions and issued its recommendation. This has ensured that after two days of industrial action, customers will not suffer any further disruption in the immediate term. In its recommendation, the Labour Court said that, if these measures are agreed to, unions should not make any further pay claims over the lifetime of the deal. It also included provisions for both sides to agree to a number of initiatives including a performance management scheme and an improved absenteeism policy. The Labour Court also recommend that the parties speak together on a number of other issues and, if they can’t reach a deal by 30 April 2018, to return to the Labour Court. These issues include payroll reform, rostering and new time and attendance arrangements. Email “The three remaining Irish Rail strikes have been suspended”. Feedback on “The three remaining Irish Rail strikes have been suspended”.